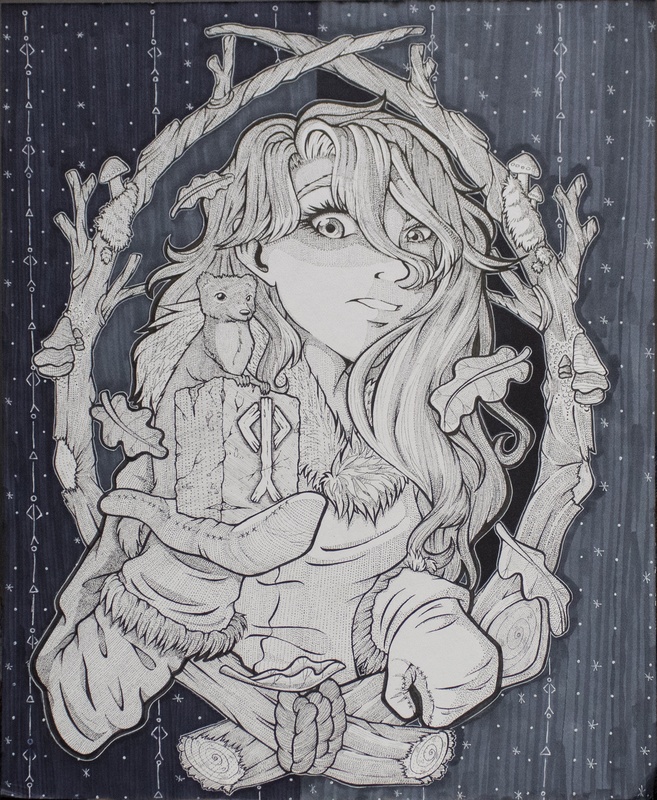 Sophomore Illustration student Hannah Miller’s piece “Green Rune” is included the Regional Juried Exhibition 2018 at The Gallery of Penn College of Technology, Williamsport. Her accomplishment was chronicled on the front page of the Muncy Luminary, which serves her hometown of Hughesville. Her pen and ink piece, created as an assignment for her 2D Design class last fall, “became a homage to the back-woods feel of home,” she said. It was inspired by the natural beauty all around the area. This open themed exhibition at the Gallery at Penn College showcases the diverse artwork produced by emerging and established contemporary artists working in a variety of styles and media by artists living within 100 miles of Williamsport, PA. . The Juror of Selection was Scott Dimond, curator for visual arts, Southern Alleghenies Museum of Art and the Juror of Awards: Ann Piper, visual artist and associate professor at Susquehanna University. Hannah was thrilled to be included as the youngest member of the exhibit, which included many of northern Pennsylvania’s well-known and professional artists. Hannah twice won first place for the cover design of the Lycoming County Fair Association booklet, in 2015 and 2016. The exhibition runs through July 27. Hours are Tuesday – Thursday: 10 a.m. - 5 p.m., Friday: 10 a.m. - 1 p.m., and Sunday: 1 – 4 p.m. The Gallery at Penn College is located at Pennsylvania College of Technology, One College Avenue, Williamsport, PA 17701.